Big Finish: Doctor Who - THE ROCKET MEN Review | Warped Factor - Words in the Key of Geek. The Companion Chronicles range of Big Finish Doctor Who audios gave the company the ability to release stories for the first four Doctors. Over the years it allowed underused or underrated companions the chance to finally get some time in the limelight, and the series also presented the chance to do stories for the past era in more modern styles. A prime example of the latter is the 2011 Ian Chesterston Companion Chronicle The Rocket Men. On the surface, The Rocket Men is a story that perfectly suits the First Doctor era. As writer John Dorney notes in the CD extras, he deliberately wanted to invoke the experimental style of the early years of the series when Verity Lambert, David Whitaker and others were figuring out exactly what Doctor Who was capable of. The story, with its rocket pack clad space pirates and skies fulls of stingray like creatures flying through the atmosphere of Jobis, is certainly in keeping with such ambitious adventures like The Web Planet. Doing it on audio, however, means that it doesn't have to worry about potentially dated special effect sequences hurting the story or any of the other issues often cited in regards to the early years of the show (like The Web Planet). Where The Rocket Men is quite different from the rest of the First Doctor era is in how its told. It's presented in a non-linear format, beginning in the middle before alternating both backwards and eventually forwards as well. The first episode swaps back and forth between the situation that Ian finds himself in with Ashman, the leader of the Rocket Men, threatening Barbara, Vicki and the other hostages, and the arrival of the TARDIS crew at the Jobis platform five floating hotel to the eventual arrival of the Rocket Men. The concluding episode moves forward from the cliffhanger to the story's ending. Dorney uses lines in the script to act as cues to move in between the various points in the story. This method works quite well though the leaps forward in the second episode, particularly in how it reveals the fate of Ashman well ahead of time, does perhaps undermine the climatic mid-air fistfight somewhat. That said, the story, and in particular the cliffhanger, works because of the non-linear way it is told. Yet The Rocket Men is also underpinned by Ian's realization of his feelings for Barbara. The Ian and Barbara relationship has always been interesting in that, if one thinks about it, it owes its entire existence to David Whitaker's early novelizations rather than what was seen on-screen. While their being married and indeed their having a son, the pop star Johnny Chess, was developed in spin-off fiction, where their relationship began hasn't been explored. The Rocket Men takes us back to the moment where Ian asked himself “When do you know?” and would risk everything to save Barbara. The story is made even more effective by the strength of William Russell's performance and the amount of understated emotion he brings with it. The result is that the strong sci-fi underpinnings have an equally strong emotional underpinning to them. 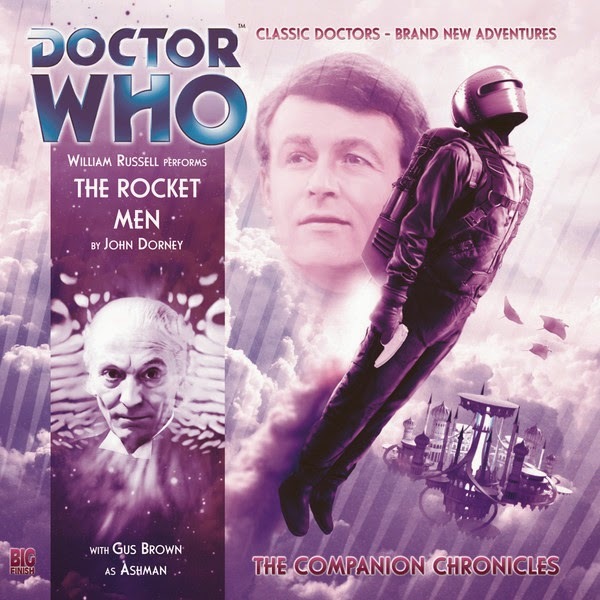 The Rocket Men is one of the standout releases of the Companion Chronicles range. It's mix of a story evocative of the First Doctor era, non-linear story telling, a strong emotional underpinning and an understated performance from its leading man, all of which combined help to make it a release that's both nostalgic yet forward looking at the same time. As a result, it's a story that shows the strengths of the range and why it has proven to be so popular with fans.